Hey all! I have a new brand on my blog today in the form of GlitterDaze. These six polishes are part of her recently released Cloud 9 Collection. I also received another collection that will be releasing next week, check back for those. So, let's talk first impressions. The packaging is gorgeous. The boxes for the polishes (which I neglected to take photos of) were pretty and luxe looking. The round bottles are easier to hold and the brush is a wider, flat brush that I prefer, as I have wider nail beds. Formula was very nice. They were a bit chalky but opaque and self leveled well. I applied two coats each for the polishes and as well as my standard topcoat. 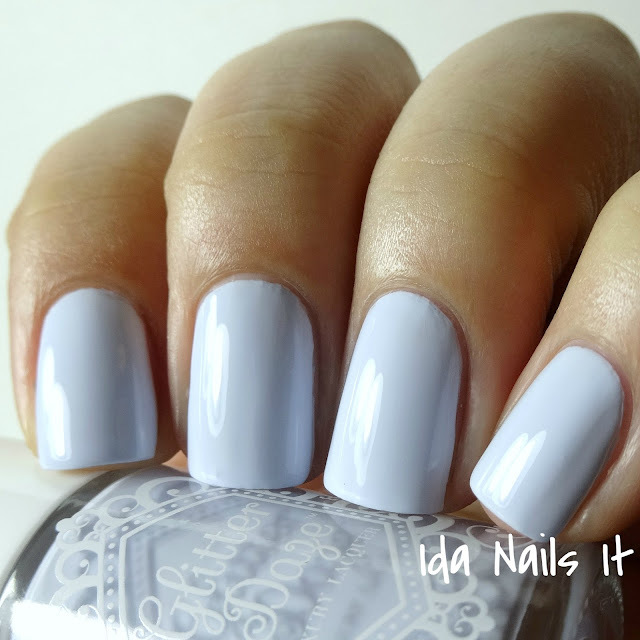 For such pale pastel colors, the fact that I could get away with two coats and have such opacity is definitely appreciated. So I will take a bit chalky if it means these lighter color covers in just a couple of coats. Pricing is appealing as well, each full size bottle is $10, which is on the mid-level for indie creme polish. The Cloud 9 Collection is available now in GlitterDaze's shop! With such opaque pastel cremes, nail art is a must! I tested these for stamping and didn't have the best luck with that, my images didn't quite lift well from the plate. So I decided to do a random dry brush look, using all the cremes in the set (with the exception of I'm Soar-T of a Big Deal). Some nice light shades these are!